The advancement of Free Software Award is given(once in a year) to someone who made a great contribution to the progress and development of Free Software. This year, the award has been given to Yukihiro Matsumoto (Matz), the creator of Ruby programming language. 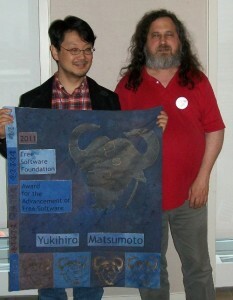 Matz got the award for the advancement of Free Software (by Richard Stallman (aka RMS, St. iGNUcius), founder of FSF) for his contribution to various GNU projects, Ruby (one of the coolest programming language (an scripting language like python), recently it has become much popular in web development due to Ruby on Rails framework) and other free softwares projects. The award for project of social benefits is give to a project or team or the ideas of the free software movements which intentionally or significantly benefits human society in other aspects of life. This year, the award goes to GNU Health, a free software projects that works with health professionals around the world to improve the underprivileged. 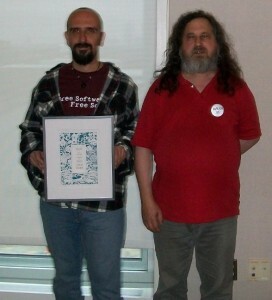 The president of GNU Solidario (the organization behind the GNU Health project) => Luis Falcon got the award by Richard Stallman for his great contribution to the society (through the free software project).